As of this writing, there are 164 customer comments and 39 answered questions for the Prextex Christmas Candy Cane Pathway Markers. I have read the customer feedback and then condensed the results into this review. I hope that this review helps you when shopping for the best outdoor Christmas decorations to add to your yard. The Prextex Christmas Candy Cane Pathway Markers can be set up on pathways, driveways, trees, and more. The short stakes attached to each candy cane marker makes it easy to install these candy cane pathway markers. Just stake them into the ground and enjoy a vibrant Christmas display of bright red and white lights. This set of candy cane pathway markers comes with 10 candy canes. Each candy cane has 6 bulbs and is 22” tall for a total lighted length of approximately 18 feet. Spare bulbs and fuse are included. This product is UL listed. They are made from weather-resistant, high-quality plastic. You can connect up to 5 sets of these candy canes end to end. These candy canes were smaller than some people expected. They are 22 inches tall, so depending on how you interpret the stock photo, you may be disappointed. Just keep in mind the size without just looking at the photo. A disappointed customer wrote, "These are around the size of a paper towel roll. It equates to about 6.50 per candy cane which is an absolute rip off for the size and price of this item. Maybe nice for a dollhouse or something but these things are absolutely laughable." But according to some customers who measured them, they are the exact size as described in the description. This customer commented, "These are cute! Color and size are perfect. I don't understand why other reviews say these are small, they are the right size (around 22 inches). Each package comes with two separate groups of five candy canes each (ten in total)." Some customers wanted to remind people that The Prextex Christmas Candy Cane Pathway Markers are bigger than a lot of others that you may find on the market. One customer said this about the size, "Love these! They are much taller than similar ones from box stores like Home Depot. I bought these after returning my shorter ones to Home Depot. They are much more obvious on my long driveway. I like the length of the full set and the fact that multiple sets can be strung together. They held up well even through some snow. Adorable!" If you are plan on adding on using the add-on cord, know that it will be a problem crossing a walkway, so you should plan using two extension cords, buying two sets or just using it on one side of your walkway. A customer commented, "This is two sets of 5 candy cane lights approximately 9' long each. The add-on plug tail is too short to cross a pathway, not to mention a tripping issue, so plan on placing these on one side of your walkway or using two extension cords. They look nice. I've gotten compliments and a neighbor up the street has a set also." The product description states that you will receive 18 feet of lighted candy canes, which would make each strand 9 feet, but in reality there is only 7 feet from a candy cane to a candy cane. A customer explained, "These are nice enough lights. They are bright and the height is good. The ground stakes they come with have a circle right below where the candy cane goes onto the stake. What's nice about that is that it helps to give you guidance as to how far into the ground to place the stake so that you don't end up with the lights at different heights. My only issue with these is that the website described the lighted length as 9 ft. To me, that would mean from the first candy cane to the last candy cane would be 9 ft. It isn't. They are only 7 ft which meant I needed to buy another set (2 strands) to complete the job. $50 I wasn't planning on spending." The Prextex Christmas Candy Cane Pathway Markers are a quality product. You may find cheaper ones at brick and mortar stores, but the ones on Amazon are better quality than a lot that you will find at department stores. A customer commented, "These candy canes were so cute and actually bright, they were a little more than the kind you could get from Wal-Mart but are thicker and soo much brighter they actually lit up my long walkway. I only planned on lighting it up one side but decided to go on both sides. Wish I had gotten a good picture but I got so many compliments on it from neighbors." You should received 10 candy canes and 10 stakes. However, some people were short on the stakes. A customer said, "I was happy at the speed of delivery from my order date. Unfortunately, there were 10 canes and it came with only seven spikes for the canes. When I tried to plant the canes on my lawn, the seven with spike were sturdy through the winds, the other three kept falling down. I wish I could have received the full complement of canes with spikes." Be aware that The Prextex Christmas Candy Cane Pathway Markers do not come with white lights. A customer describes them this way, "These are a nice size and work great along my sidewalk. My only suggestion would be to make them red and white when lit. They are pretty much all red. However, I do love them! Thanks for a good product." The Prextex Christmas Candy Cane Pathway Markers were priced well, but not a great bargain. Most felt the price was just right for what they received. A customer commented, "These were easy to assemble and look great lighting our walkway. Made well enough for their price point. We are pleased and would buy again." Some people were frustrated with the fact that the stakes kept coming out of the ground. Here is one of the customer comments about stakes coming out, "They didn't stick in the ground very well. Had to keep putting several of them back in, over and over. Pretty annoying. The kids loved them though, so it was still worth it." A lot may depend on whether or not your ground is frozen. If you put them in the ground and ground freezes or was frozen when you put them in, they should have a better chance of staying put. Another customer said, "These are great, stayed stuck in the ground even during heavy midwest winds. Bright and cheery for the holidays. Great for the price. I'm going to order another set for next year to have a longer candy cane path." 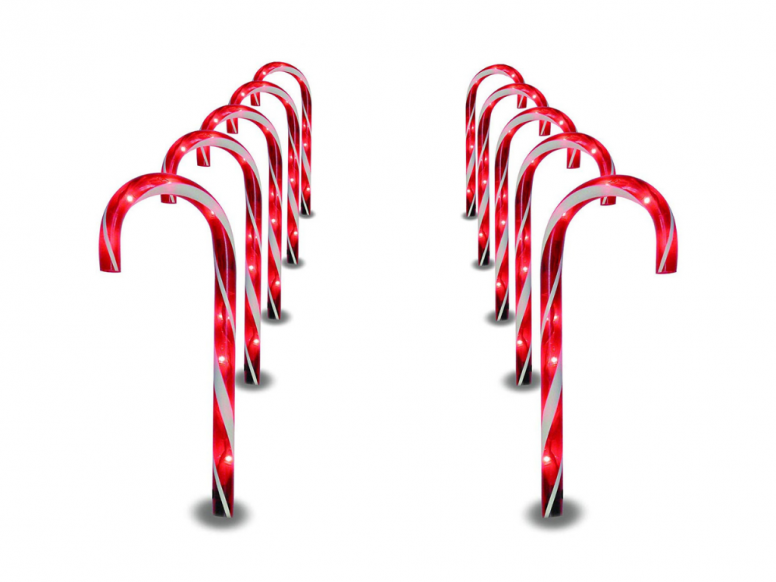 The Prextex Christmas Candy Cane Pathway Markers has stakes attached to each candy cane marker. This makes it easy to install these candy cane pathway markers. Simply stake them into the ground. Included in the set are 10 candy canes. Each candy cane has 6 bulbs and is 22” tall for a total lighted length of approximately 18 feet. Spare bulbs and fuse are included. The candy canes are made from weather-resistant, high-quality plastic. You can connect up to 5 sets of these candy canes end to end. 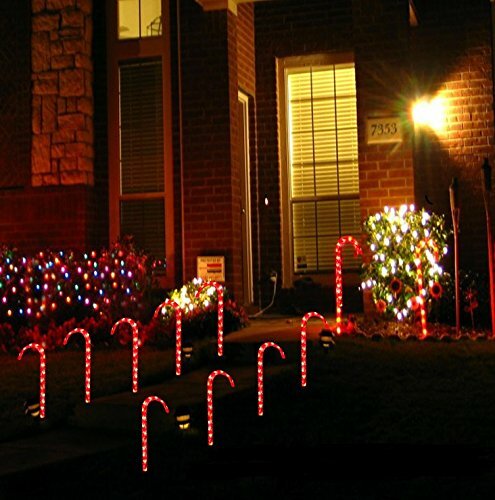 If you plan on using 5 candy canes on each side of a walkway, think again because the connecting cord that is included is not very long. Also, you will have a tripping hazard with a cord going from one side to the other. Also, the lights are not both red and white, but just red. Some customers were disappointed in the color of the lights lacking the white. Keep in mind the size of these candy canes are just 22 inches tall. Some people just looked at the product photo which can be misleading in size. Other than that, these candy cane displays sell at a good price and are a quality product. Here are some top questions that I found for people considering buying the Prextex Christmas Candy Cane Pathway Markers. Do these candy cane pathway markers plug into each other? Yes, they do plug into each other. Can I set these candy cane pathway markers on cement? No, because the stakes need to go into the ground in order for these candy cane pathway markers to stand. Are these outdoor Christmas decorations solar? No, they are electric.